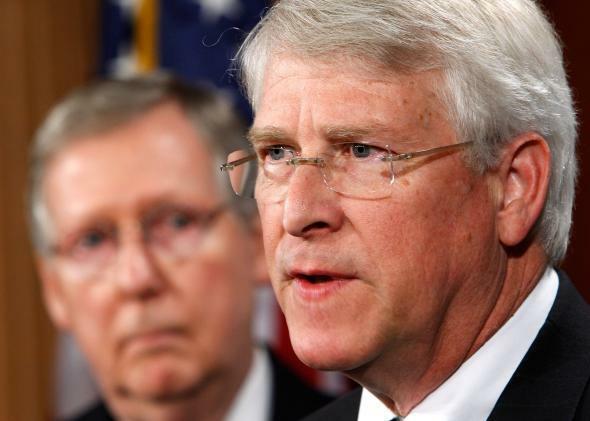 Mississippi's Roger Wicker to head NRSC, otherwise known as the worst job in D.C.
I’m watching over your shoulder, Wicker. It’s all on you. Sen. Roger Wicker (R-Miss.) just got the worst job in Washington. OK, maybe not the worst-worst—it’s not like he’s doing public relations for WMATA—but on Thursday morning his fellow Republican Senators voted to put him in charge of the National Republican Senatorial Committee for this coming election cycle, which means he’ll oversee the committee responsible for consolidating and growing the GOP’s Senate majority. That may not sound terrible, but the 2016 contests have a chance to be to Senate Republicans what the 2014 contests were to Senate Democrats; in other words, carnage and mayhem. That’s because, as Wicker said in a short conversation after winning the gig, there are 24 Republican-held seats up for election that year and just nine seats held by Democrats. So Republicans will be playing a lot of defense. On top of that, presidential electorates are much kinder to Democratic candidates than midterm electorates, as my colleague Jamelle Bouie discussed at length earlier this month. On top of that, the Republican senators up for re-election in 2016 will have to defend seats they won in the GOP wave election of 2010. That year, under enormously favorable conditions, a number of Republican candidates won seats that could be tough to keep in a more Democrat-friendly climate. A host of blue- and purple-state Republicans—including Sens. Kelly Ayotte (New Hampshire), Rob Portman (Ohio), Mark Kirk (Illinois), Pat Toomey (Pennsylvania), Ron Johnson (Wisconsin), and even Marco Rubio (Florida)—could face tough, expensive reelection slogs. And now, all of that is Roger Wicker’s problem. The immediate plan: Get as big a head start as possible on fundraising.